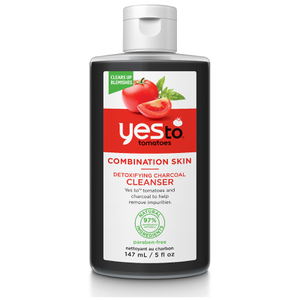 Deeply cleanse in one simple sweep with the Yes To Tomatoes Detoxifying Charcoal Micellar Cleansing Water; a skin-loving treatment specifically developed for oily and acne-prone skin. Based upon a naturally derived formulation, the cleanser is powered by the impurity-extracting properties of Micellar as well as antioxidant-rich Charcoal for unparalleled results. It efficiently removes makeup, dirt and oil from skin without causing dryness, helping to unclog pores and lift away grime to leave skin feeling fresh, hydrated and healthy with a more even and balanced tone. The easy-to-use pump ensures the perfect amount of product is dispensed for waste- and mess-free application. Simply shake to activate – the unique composition doesn’t leave behind any black residue and there’s no need to rinse for quick and effortless results. Free from parabens, SLS and silicones. Cruelty free. Flasche schütteln, um die Kohle zu aktivieren. Pumpe anschließend drehen, um sie zu entsperren. So viel Mizellenwasser wie nötig auf einen Wattebausch oder ein Wattepad pumpen (zwei Pumpstöße sollten ausreichen). Sanft über das Gesicht streichen. Muss nicht abgespült werden. Aloe Barbadensis (Aloe) Leaf Juice, Water (Aqua), Pentylene Glycol, Polyglyceryl-4 Laurate/Sebacate, Polyglyceryl-4 Caprylate/Caprate, Caprylyl/Capryl Glucoside, Hamamelis Virginiana (Witch Hazel) Water, Charcoal Powder, Solanum Lycopersicum (Tomato) Fruit Extract, Propandiol, Biosaccharide Gum-1, Niacinamide, Chlorhexidine Digluconate, Disodium EDTA, Sodium Hydroxide, Lepidium Sativum Sprout Extract, Glycerin, Lecithin, Fragrance (Parfum), Benzyl Benzoate, Coumarin, Butylphenyl Methylpropanal.